To celebrate our 50th milestones, my husband John and I booked a trip to Tanzania to climb Kilimanjaro and go on safari. Although, this was our trip of a lifetime, we also wanted to do something for the people of Africa but were unsure of how to go about it. Coincidentally, my Costco Connections newsletter arrived and there was an article about Pack for a Purpose. I immediately went to the website and read all about it. It was exactly what we were looking for! 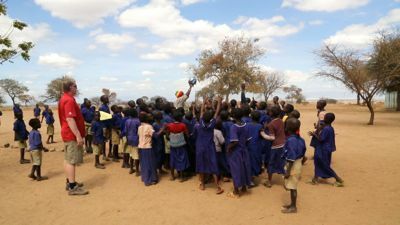 After reviewing options for Tanzania, we selected the Mswakini Juu Primary Maasai school just outside Tarangire park. I contacted Rebecca at PfaP and she immediately put me in touch with Alpha Malinda from Karanga Adventure Tours, who is the facilitator for that school. When we told our friends and family members what we were doing, they immediately wanted to assist. It was especially gratifying to hear that some of the friends’ children were so intrigued by what we were doing that they contributed some of their special toys, clothes and soccer uniforms. Within 2 weeks, with what we personally had purchased and what everyone else contributed, we had over a 100 lbs of supplies! 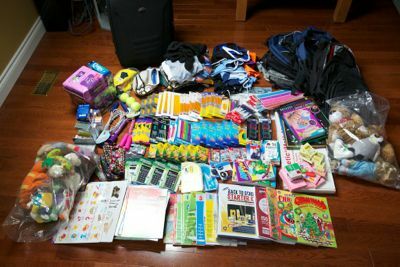 Pencils, pens, crayons, colouring pencils, sharpeners, notepads, exercise books, math & english learning books, rulers, calculators for the teachers, flash cards, soccer balls, soccer uniforms, backpacks, clothes, bandaids and feminine hygiene products… too many items to list! We made arrangements to hand over the goods at the beginning of the trip before our climb because we couldn’t take them with us. Alpha was on business in India and had his colleague, Adam, pick them up from us. 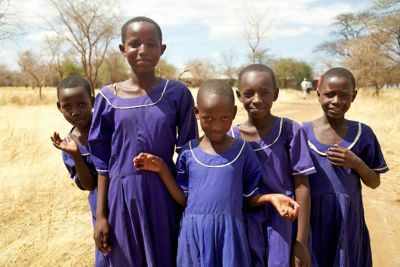 I was disappointed as I was really hoping that somehow we would have an opportunity to see the school for ourselves. To our surprise, two weeks later while on our safari, Alpha tracked us down through our safari tour company, Hoopoe Safari Tours. He worked with Ursula and Freddy (the driver), to coordinate a meeting at the school on our last day in Tanzania. By chance, the school happened to be in the vicinity of where we were that same day! Our experience at the school was overwhelming. We first met with the principal and Alpha and discussed how the supplies would be distributed. At that point, the principal called all the students into the courtyard where we greeted them and they sang their national anthem. We proceeded to distribute the school supplies to both the teachers and the students. We then inflated the soccer balls and enjoyed watching the children scream with joy as they kicked the balls around the schoolyard. It was a truly emotional experience. Afterwards, we also toured the school grounds and saw the shell of the new medical building which will hopefully be completed in the near future and is in desperate need of all medical supplies. In summary, our experience was beyond expectation, fulfilling and definitely something we will do again in our future travels. We would like to thank Rebecca from Pack for a Purpose for working with us to make this a reality, Alpha & Adam from Karanga Adventure Tours for going above and beyond in coordinating our visit to the school, and Ursula and Freddy from Hoopoe Safaris East Africa tours for being very cooperative and going out of their way to help us achieve this. And of course, all our friends and family who helped contribute to this wonderful cause. There is nothing more fulfilling than seeing a smile on a child’s face, and we all have the ability to make that happen. On your next vacation, all you need to do is Pack for a Purpose!